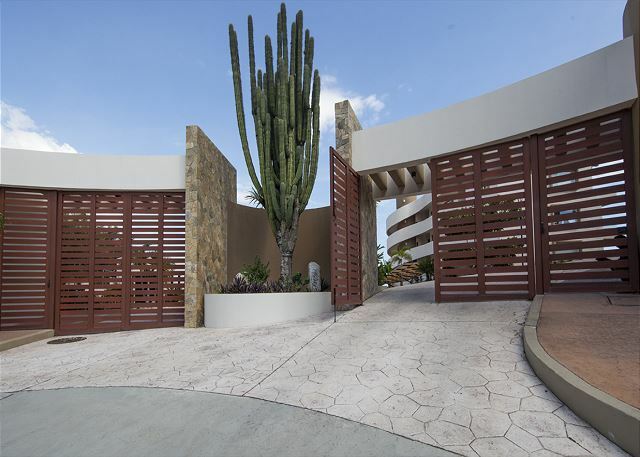 Newly built and furnished 2 bedroom condo in the sought after location of Residencial Arrocito. Enter through the door and be amazed at the views before you. It's stunning and quiet all at once. Take your morning coffee from the ocean view terrace. Prepare meals from the gourmet kitchen as the waves crash below and the sun sets over the hills. Designed with open living and dining areas and sleeping spaces for six. Cool porcelain floors. Warm slate walls.. Sunlight streams in. Feel the warmth of the sea breezes. 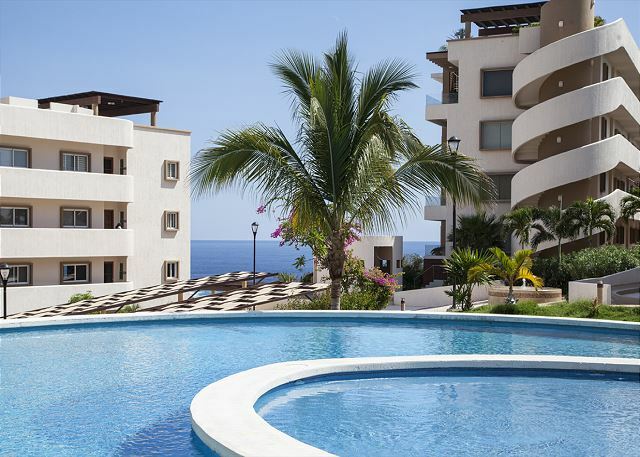 Refresh from the heat in one of the multiple pools. 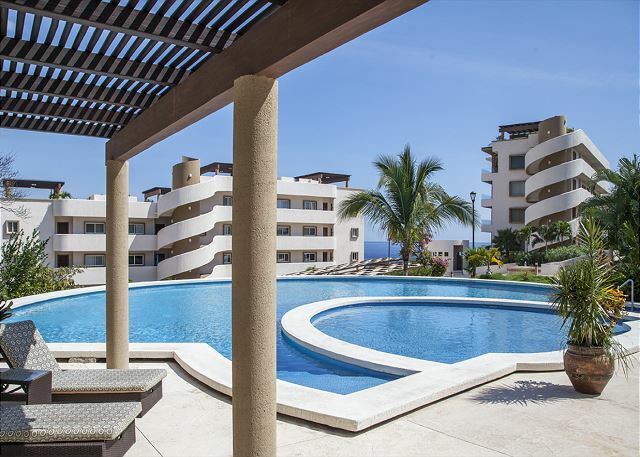 Or find your way to the nearby beach to snorkel or splash in the calm Pacific water. It's the ideal place to vacation. We were two couples staying for five days at this condo. The condo was attractive, well-equipped, spacious, conveniently located, and had an unbelievable view of the ocean where we watched whales and boats come and go. Unfortunately there was a problem at times with sewer gas odour coming into the apartment. The pools were large and the whole area was generally quiet. We spent a lot of time on the deck enjoying the great weather. We enjoyed walking to the beach, Ocean's restaurant, and ordering drinks and tasty snacks at Lolo's the street vendor right outside our gate. The local staff were efficient and friendly. One drawback was the unexpected, large admin fees charged by HomeAway. Good location. Taxis always available outside complex to get you where you want to be. Location a little farther away from Santa Cruz and Crececita necessitating reliance on taxis. However they are cheap and a short distance away. Condo itself was comfortable and had all we needed. 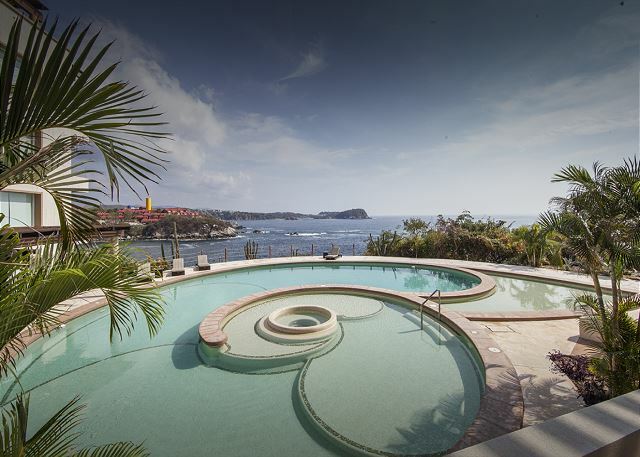 My wife and I love the location for its quietness and incredible ocean views. It was exactly what we were looking for. This was our second stay and we will be going back. The condo was as advertised and more. The view from the balcony is breath taking, and enjoyed every moment sitting on the balcony. 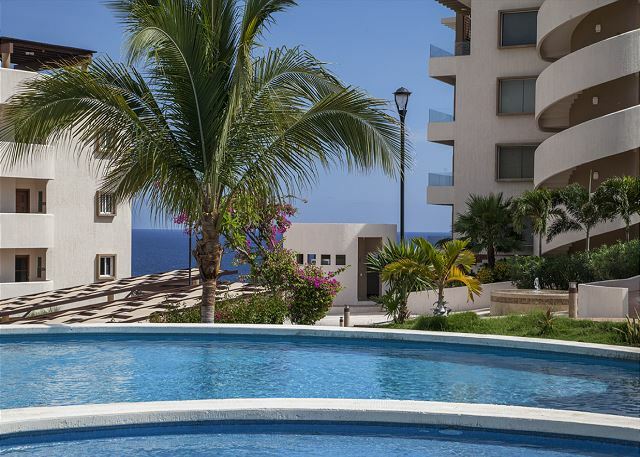 The condo is supplied wonderfully with items you require during your stay. The staff of the condo complex are wonderful. They are always willing to assist you if needed. The location of the beach is great, just a short 5 minute walk. If you want a beverage you are able to buy and a great price. Did not try any of the food, so can't comment on the food served. We did use the pool, but not much as we are beach people, or we were in town. To get to town, the taxi was cheap(43pesos) and the gentlemen at the gate would order it for you. The ride is about 10 minutes to La Crucecita and maybe 12 minutes to Santa cruz for same price. Found wonderful places to buy fresh fruit/veggies(as recommended by the property staff)and fresh fish at the market. Was easy to get a cab anywhere in either of the towns. 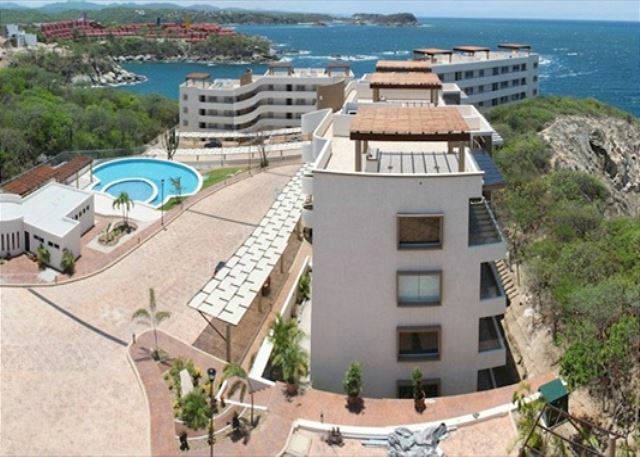 We thoroughly enjoyed our time in Huatulco, and would definitely return and to the same complex. Did go to the organic market held in Santa Cruz which is every second saturday. Not a big market, but able to buy some fresh fruits/veggies. Great price for vanilla. Restaurants in town are all great to try and very reasonable. Loved the quaintness of Huatulco. Can't say enough of the wonderful staff with My Huatulco vacations. Very helpful in any questions you may have, and willing to provide information or make a restaurant reservation. Very relaxing with a world class view. Perched high overlooking the Pacific made sitting on the deck a favorite pass time. Condo was well equipped, and beautifully decorated creating a feeling of home. Area is very quiet and is definitely a great place to vacation. Punta Arrocito was lovely. Our unit was clean and well appointed. 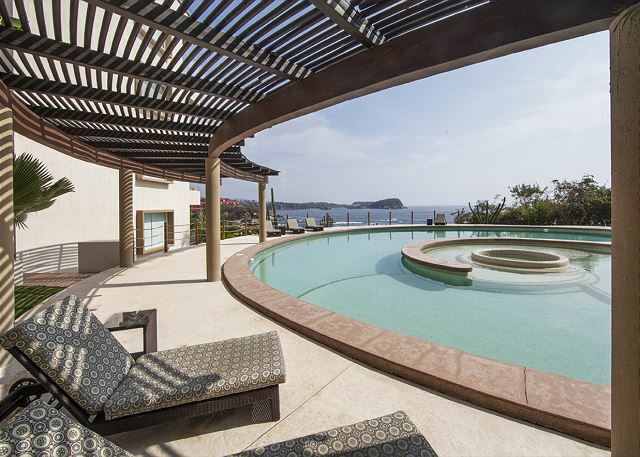 Working with My Huatulco Vacations was convenient and easy. I would highly recommend the unit and this booking agent. This condo is a gem! The unit was immaculate and very well supplied with everything we needed. It exceeded my very high expectations!The balcony terrace was private and quiet, and the view was breathtaking. We even saw two whales one morning from the balcony. The beach at Playa Arrocito had warm, calm waters and amazing snorkeling. We were able to use a table, chairs and umbrella at the beachside restaurant for the entire day at the beach, and got great seafood and drinks. 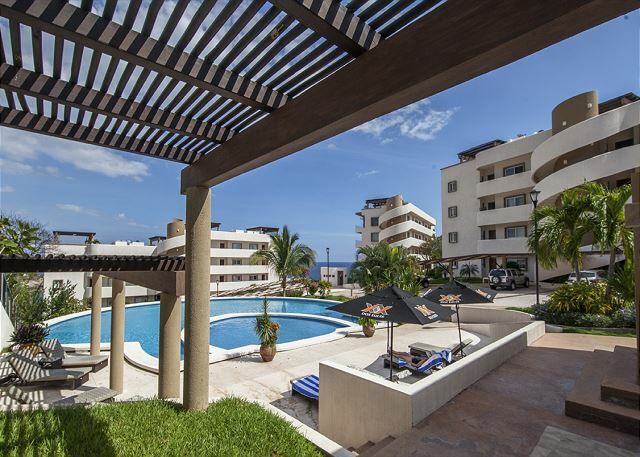 We will definitely return to Punta Arrocito again and request the same unit!